The growth in grid databases, coupled with the utility of parallel query processing, presents an important opportunity to understand and utilize high-performance parallel database processing within a major database management system (DBMS). This important new book provides readers with a fundamental understanding of parallelism in data-intensive applications, and demonstrates how to develop faster capabilities to support them. It presents a balanced treatment of the theoretical and practical aspects of high-performance databases to demonstrate how parallel query is executed in a DBMS, including concepts, algorithms, analytical models, and grid transactions. 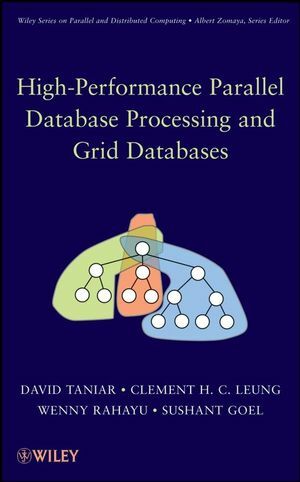 High-Performance Parallel Database Processing and Grid Databases serves as a valuable resource for researchers working in parallel databases and for practitioners interested in building a high-performance database. It is also a much-needed, self-contained textbook for database courses at the advanced undergraduate and graduate levels. David Taniar, PhD, lectures in information technology at Monash University, Australia. Dr. Taniar has published extensively in the field of high- performance parallel databases and is the Editor in Chief of the International Journal of Data Warehousing and Mining. Clement H. C. Leung, PhD, is Foundation Chair in Computer Science at Victoria University, Australia. Dr. Leung previously held the Established Chair in Computer Science at the University of London. Wenny Rahayu, PhD, is Associate Professor at La Trobe University, Australia, and actively works in the areas of database design and implementation, covering object-relational databases and Web databases. Sushant Goel, PhD, is a software consultant and holds a PhD in computer systems engineering from RMIT University, Australia. His research interests are in grid transaction management and software development processes, such as agile computing. 1.1 A Brief Overview: Parallel Databases and Grid Databases. 1.2 Parallel Query Processing: Motivations. 1.3 Parallel Query Processing: Objectives. 1.7 Structure of this Book. 2.4 Basic Operations in Parallel Databases. PART II: BASIC QUERY PARALLELISM. Chapter 4: Parallel Sort and Group-By. 4.1 Sorting, Duplicate Removal, and Aggregate Queries. 4.2 Serial External Sorting Method. 4.3 Algorithms for Parallel External Sort. 4.4 Parallel Algorithms for GroupBy Queries. 4.5 Cost Models for Parallel Sort. 4.6 Cost Models for Parallel GroupBy. PART III: ADVANCED PARALLEL QUERY PROCESSING. Chapter 6: Parallel GroupBy-Join . 6.2 Parallel Algorithms for GroupBy-Before-Join Query Processing. 6.3 Parallel Algorithms for ?GroupBy-After-Join? Query Processing. 6.5 Cost Model for "GroupBy-Before-Join" Query Processing. 6.6 Cost Model for "GroupBy-After-Join" Query Processing. 7.1 Parallel Indexing - An Internal Sight of Parallel Indexing Structures. 7.5 Parallel Processing of Search Queries Using Index. Chapter 8: Parallel Universal Quantification ? Collection Join Queries. 8.1 Universal Quantification and Collection Join. 8.2 Collection Types and Collection Join Queries. 8.3 Parallel Algorithms for Collection Join Queries. 8.4 Parallel Collection-Equi Join Algorithms. 8.5 Parallel Collection-Intersect Join Algorithms. 8.6 Parallel Sub-Collection Join Algorithms. Chapter 9: Parallel Query Scheduling and Optimization. 9.2 Sub-Queries Execution Scheduling Strategies. 9.3 Serial vs. Parallel Execution Scheduling. 9.5 Cluster Query Processing Model. 9.6 Dynamic Cluster Query Optimization. 9.7 Other Approaches of Dynamic Query Optimization. Chapter 10: Transactions in Distributed and Grid Databases. 10.2 Distributed Database Systems and Multidatabase Systems. 10.3 Basic Definitions on Transaction Management. 10.4 ACID Properties of Transactions. 10.5 Transaction Management in Various Database Systems. 10.6 Requirements in Grid Database Systems. Chapter 11: Grid Concurrency Control. 11.1 A Grid Database Environment. 11.4 Correctness of GCC Protocol. 11.5 Features of GCC Protocol. Chapter 12: Grid Transaction Atomicity and Durability. 12.2 Grid Atomic Commit Protocol (Grid-ACP). 12.3 Handling Failure of Sites with Grid-ACP. Chapter 13: Replica Management in Grids. 13.3 Grid Replica Access Protocol (GRAP). Chapter 14: Grid Atomic Commitment in Replicated Data. 14.2 Modified Grid Atomic Commitment Protocol. 14.3 Transaction Properties in Replicated Environment. PART V: OTHER DATA INTENSIVE APPLICATIONS. Chapter 15: Parallel Online Analytic Processing (OLAP) and Business Intelligence. 15.2 Parallelization of ROLLUP Queries. 15.3 Parallelization of CUBE Queries. 15.4 Parallelization of Top-N and Ranking Queries. 15.5 Parallelization of CUME_DIST Queries. 15.6 Parallelization of NTILE and Histogram Queries. 15.7 Parallelization of Moving Average and Windowing Queries. Chapter 16: Parallel Data Mining - Association Rules and Sequential Patterns. 16.1 From Databases, Data Warehousing, to Data Mining: A Journey. 16.2 Data Mining: A Brief Overview. Chapter 17: Parallel Clustering and Classification.